Here are a few more photos of my own models. This model must be nearly 10 years old now, and is still going strong, though the blue tissue markings are now so bleached that they are hardly visible! 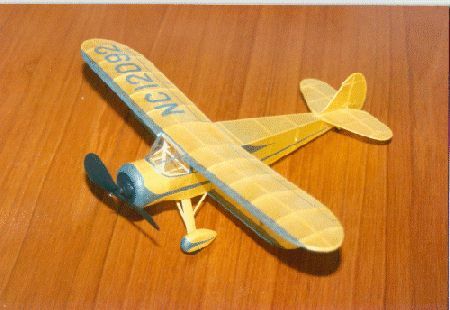 It was built from the Walt Mooney plan, the only alteration being to fit movable elevators and rudder, hinged with short pieces of soft wire (from sandwich bag closures). Finish is unpainted Japanese tissue. Weight without rubber is 12.5 g, including a woodscrew in the nose to get the c of g correct. It flies very nicely, both indoor and out (weather conditions permitting, of course). Another peanut scale model, this time one I designed myself. Ugly looking beast isn't it? - Got charactor though. The full size aircraft was designed as a lightweight ASW machine for the Royal Navy, but it was a victim of defence cuts before it could go into service. The model flies pretty well, though I haven't ever broken the 30 second barrier - probably too heavy as usual! The tailplane and fin have scale outlines - tail moment is short, but the tailplane is huge! Covering is Japanese tissue, airbrushed with enamels, and using roundel decals from my spares box. Radome is hollow balsa, and the prop made from 2 Kaysun 4" items. Wheels came from an old plastic kit. 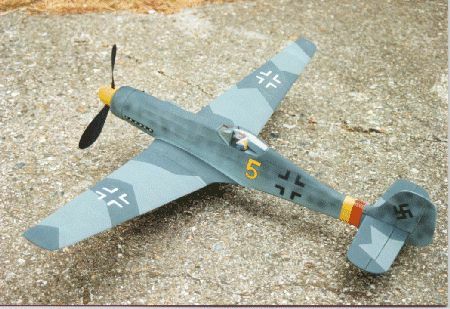 Click here to download a free plan for this model. I have also made the old, and rather less accurate, Veron kit of the Seamew and a photo of it can be found elsewhere on the site. Keil Kraft used to do a much larger version (27.5" span) which I built as a kid - this is pretty accurate, and is on my list of future projects. I admit I did go to town rather on this one. 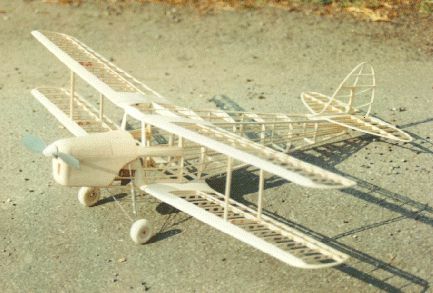 I designed the model using Alf Grainger's scale drawings and the framework is pretty much as per full size - scale rib spacing, scale fuselage structure etc. I included a working sprung undercarriage, and "knock-off" wings using wires and aluminium tubing. Rigging is elastic thread, so non-functional (after all, I want the wings to come off in a bad crash). Power is from a Knight and Pridham KP-02 electric unit. Took me a year or so to build (on and off). The colour scheme was taken from an example I saw and photographed at an Old Warden flying day. Weight is a hefty 176 g - despite moving the battery pack as far back as I could, I still needed to install a metal bolt at the tail to get the balance point correct. The better thing to have done would have been to solder on longer wires of course. 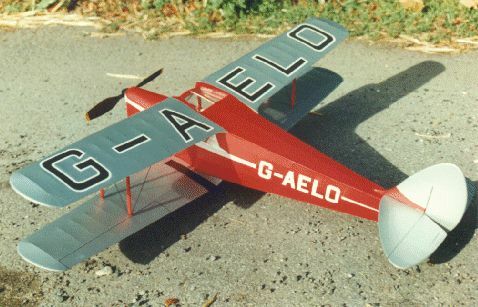 I flew the model reasonably successfully a few years ago at one of the Old Warden model flying days - it climbs well under power, gently circling - problem is, when the motor stops, the model gets into a series of ever deeper stalls (I think because the glide straightens out). Not too much of a problem if the model has not got too high, but rather nerve-wracking when it has a long way to come down - just a matter of luck at which point in the stall it hits the ground! I must get round to getting the trim finally sorted one day. This is the jumbo rubber powered Al Lidberg design - a super plan to build from, and I did not change anything at all. I used white Japanese tissue and airbrushed the finish using Humbrol enamels thinned with cellulose thinners. 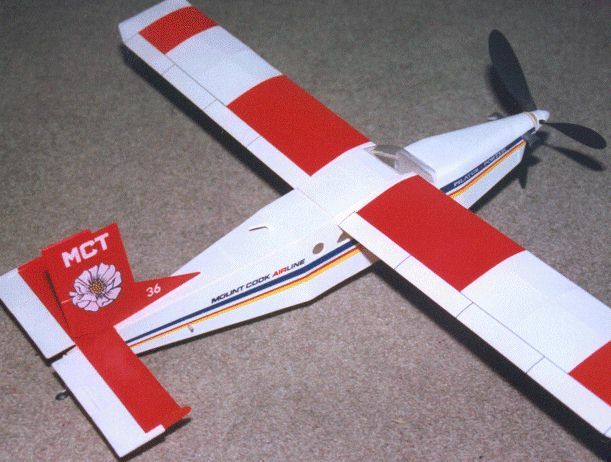 After a few years flying with the undercarriage attached, when the model performed fairly well, without ever reaching great heights, I removed the wheels after a heavy landing had caused some damage, and had a go at flying it wheels up (this was 2002). It now flies better than it ever did, and looks really good in the air, like a proper fighter. Using three loops of 3/16" rubber, it will now stay for over a minute, and get to a really good height. The only drawback to removing the undercarriage has been that almost every landing results in one of the prop blades snapping off. I am sure adding a conventional two bladed prop would cure this, but for now I will just keep getting out the cyano bottle. 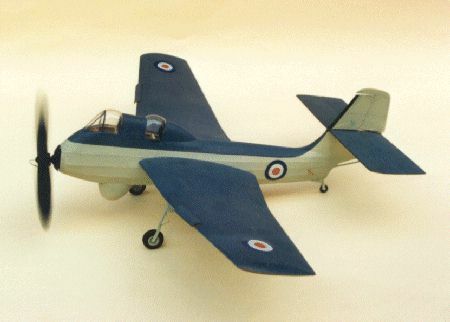 Built from the excellent Airsail kit, the model has a wingspan of 28", and weighs in at a reasonable 47.5 g. All parts are die cut, and a nice decal sheet is supplied both for a military example, or the colourful Mount Cook Airlines scheme that I chose. Wheels and nose cowls are light vac-form mouldings. I replaced the kit tissue with white Japanese tissue to give a smoother surface for the enamel paint finish. I also replaced the kit prop with a three-blader made from one and a half peck props (with extensively thinned blades) fitted into a ply-faced balsa hub. Initial test flights on a local sports field looked very promising. I needed no noseweight, and just a slight tweak up on the trim tabs I incorporated in the tailplane, to obtain stable left hand circuits. Two loops of 1/8" Tan II rubber about 22" long seem to give enough power. I have since had the chance to pile the winds on, and although it climbs out well and circles around in a very stable fashion, the glide is quite poor. It you try to add up elevator or remove noseweight, to correct this, then you tend to get stalling under power. Thrustline adjustments don't seem to help either. Despite this minor gripe, this is definitely a good candidate for a first flying scale model - you don't find many scale models with proportions as close to a rubber duration model as this!